^ John Gimbel "On the Implementation of the Potsdam Agreement: An Essay on U.S. Postwar German Policy" Political Science Quarterly, Vol. 87, No. 2. (Jun., 1972), pp. 242-269. ^ (Cordell Hull, Memories, (New York: 1948) volume II, pp. 1602–3). ^ (John Morton Blum, "From the Morgenthau Diaries: Years of War, 1941 – 1945" (Boston, 1967) p. 338). ^ (The Roosevelt Letters, volume III: 1928–1945, London, 1952). ^ Fleming, Thomas The New Dealers' War: F.D.R. And The War Within World War II. Basic Books, 2001, pg. 432. ^ (Memorandum by Harry Dexter White for the Secretary of the Treasury, September 25 1944, Memorandum by the Deputy Directory of the Office of European Affairs for the Secretary of State, September 20 1944). ^ Michael R. Beschloss, The Conquerors: Roosevelt, Truman and the Destruction of Hitler's Germany, 1941–1945, pg. 144. ^ Michael R. Beschloss, The Conquerors: Roosevelt, Truman and the Destruction of Hitler's Germany, 1941–1945, pg. 144–45. ^ Michael R. Beschloss, The Conquerors: Roosevelt, Truman and the Destruction of Hitler's Germany, 1941–1945, pg. 172–173. ^ (Robert Murphy, "Diplomat Among Warriors", (London: 1964) p. 251). ^ Pas de Pagaille! Time Magazine, July 28, 1947. History of German-American Relations U.S. Embassy in Germany, collection. Small collection at TeachingAmericanHistory.org, Ashland University. 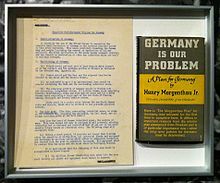 The original Morgenthau Plan from 1944 The plan signed by Roosevelt and Churchill was a modified version of this. United States Secretary of State James F. Byrnes Stuttgart speech, September 6, 1946 The speech was according to General Clay based on the letter Clay had sent Byrner urging him to come to Stuttgart. General Lucius D. Clay Deputy to General Eisenhower, 1945; deputy military governor, Germany (U.S.) 1946; commander in chief, U.S. Forces in Europe and military governor, U.S. Zone, Germany, 1947–49; retired 1949.